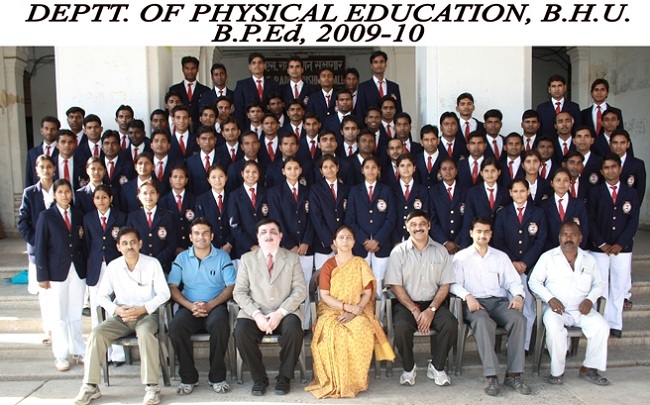 The Section of Physical Education was established in the year 1965 with Diploma course in Physical Education in the Arts Faculty B.H.U. It was later on transferred to the Faculty of Education in the year 1968 . Again, from July 1972 the Department was brought back to the Faculty of Arts with one year Diploma in Physical Education under the leadership of Prof. Karan Singh. On the recommendation of Dr. Joseph and Dr. Chopda Committee B.P.Ed. course started from the Session 1973-74 and then M.P.Ed. (one year) course was started from 1983-84 session. Enrolment for Ph.D. was started from March 1986. B.PE. (three years) was run from1997-2003,therafter B.P.E. (four years) from 2003-2005. From 1985-2005 M.P.E. course was run . After getting NCTE and NACC recognition in 2006 M.P.Ed. (four semesters) and B.P.Ed. (one year)course was restarted. B.P.Ed two year (four semesters) courses was started in2015. The Department has Library and a well equipped laboratory for Exercise Physiology, Sports Psychology, Physiotherapy Human Performance Training, Computer, Yoga. The Department proposes to offer Diploma courses in Sports Management, Sports Physiotherapy, Sports Psychology shortly. Job placement of the students is above 80%. Till now Department has nearly 70 JRF and 150 NET qualified students. This is also in a process to upgrade the department into an institute/Faculty. The department have a separate building with all the required facilities and infrastructure of teaching and learning as per UGC, NCTE, NAAC norms.